Lewis Meriwether was born on 18 August 1774 in Virginia. Lewis didn’t go to school before 13. He loved being outside and hunting. As a teenager, he walked in the middle of the night even in winter with his dog to go hunting. When he was a child, he was interested in natural history and he had this passion all his life. He tried to make medicines with wild herbs. In his life he was a soldier, an explorer and the secretary of Thomas Jefferson in 1801. He was sent by Thomas Jefferson to explore Louisiana with William Clark. First, Jefferson asked Lewis and Clark to explore and map the unexplored territory, particularly the Missouri River and its tribes. Secondly, Jefferson asked Lewis and Clark to observe, record and collect specimens of the plants and animals. Finally, the president of the USA asked Lewis and Clark to seek the original tribes, study their language and make friends with them if possible. Lewis and Clark Went to explore the new territory with 33 team mates. The expedition lasted 2 years. The expedition reached the Pacific Ocean in 1806. In all, 178 sorts of plants and 122 sorts of animals were described. The expedition was a real success. 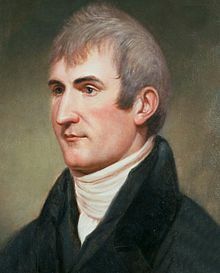 President Thomas Jefferson appointed him Governor of Upper Louisiana in 1806. He died of gunshot wounds.